This is a boxed cake mix made in a 13×9 cake pan. I searched and searched for a Curious George cake pan without any luck so we decided we’d have to freehand one. First I frosted the entire cake in yellow. I then outlined George’s face from a coloring book page and piped that in with small stars. I piped larger stars around the edge in red. I had found some Curious George rings in the party favor area at our local party store so I pushed those into the cake in each corner for some extra decoration. 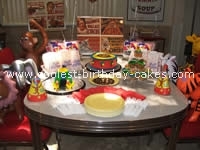 The day of the party we surrounded the cake with bananas and curious George stuffed animals and toys. To prepare Curious George Cupcakes make cupcakes as desired. Pull paper liners from cupcakes and turn upside down on a cooling rack. Drizzle melted chocolate over the bottom of the cupcakes then allow to cool until hard. Use Butter cream icing to decorate the top of cupcakes. To make the Palm Trees use small pretzel rods. A day prior prepare leaves made with Royal Icing. Attach leaves to pretzel rods with Royal Icing. 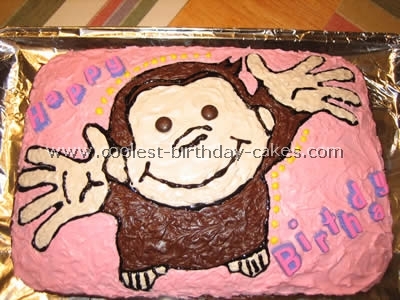 I made this Curious George cake using cake mixes and buttercream frosting. I prepared the cake mixes and baked 3 cakes in Pyrex glass bowls and 2 cakes in 9×13 inch pans. I used the bowl shape cakes to make the belly, face, and the top of the hat of Curious George. I cut out 3 circles from the rectangle cakes to make the rest of the hat. I also cut out the arms, legs, ears, feet, and hands from the rectangle cakes. I did all the cutting of the cake freehand and used toothpicks to hold certain pieces together. The cake gives you the basic shape but it’s the icing that really gives the detail. My daughter had a Curious George t-shirt that was a good size picture of him. I put a book in the shirt (something hard to write on) and traced the image onto wax paper. 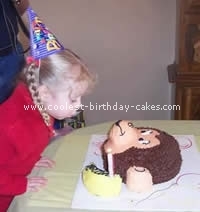 I then cut the Curious George picture out, put it on the cake and used decorating gel in a tube to trace the picture. Some of the lines on the inside of the face I traced as well by cutting out what I needed. The rest was freehand. Then to frost I used a toothpick to get into the smaller areas or to get it right up to the outline. I think it turned out pretty cute! 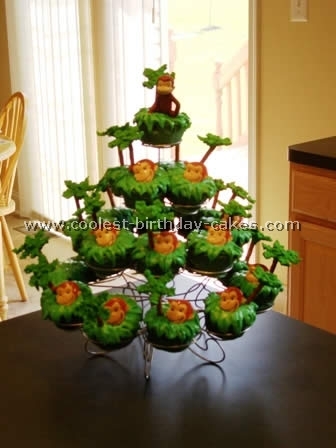 I actually got the layout from another monkey cake online. 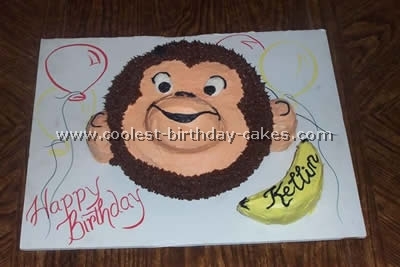 I wanted this cake to look more like Curious George and less like a generic monkey so I improvised. 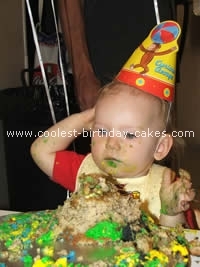 I used a round layer cake for the face and cupcakes cut in half and stacked for the ears. 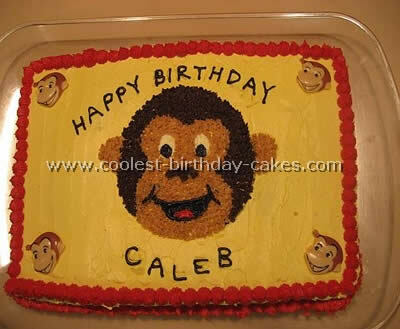 I used tan and brown frosting and copied the mouth, nose, and eye placement out of a Curious George book. I was afraid I would screw up the pupils in the eyes so I used peanut m&m’s to solve that problem. Chisel the 8" cake into 4 sections: an oval muzzle approximately 5"x3" two semi-circle ears approximately 2"x3" each and a banana shape – mine was about 6" long. After assembling the 10" cake layers round the top to give the head a more 3-dimensional look. (It’s hard to observe with the angle of this particular photo.) Round the top and sides of the muzzle and attach it to the head with a lollypop stick. Attach the ears the same way. Draw with a butter knife the outline of George’s face and frost the designated area and the attached muzzle the flesh color. Frost the ears as well. Smooth to your preference. 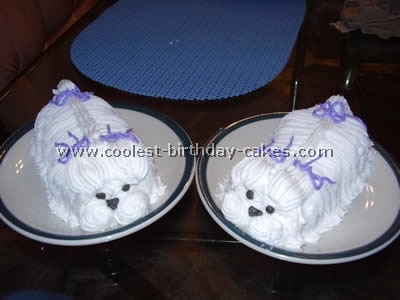 Next put chocolate frosting in a decorating bag and add George’s fur all over the rest of the cake with a star tip so George looks nice and fuzzy. Now add the details. Use your spatula to add on the whites of the eyes. Color some white frosting black (1/2 cup is plenty) and put into another decorating bag with a standard round writing tip. Detail the eyelids, pupils, ears, nose mouth and George’s little tuft of hair on the top of his head which is also difficult to make out in this photo. Also detail the banana with lines and the child’s name. I decorated the cake right on the foam board shown and then added the birthday wishes and balloons for fun. I personally use Wilton brand gel food coloring as I think it does the most consistent job. 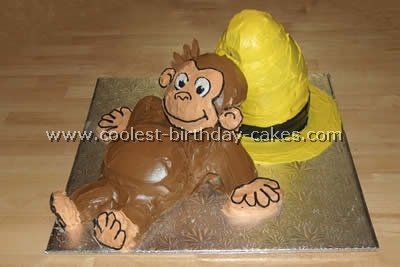 Make sure you use an old-fashioned sturdy cake recipe to withstand the sculpting required for this Curious George cake. Mixes don’t work well! 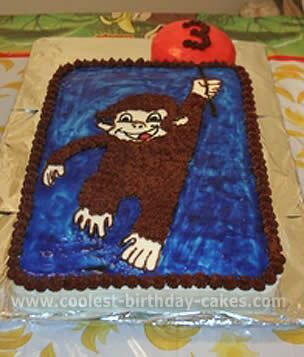 For my son Ryland’s third birthday party we had all things Curious George. We had recently gone to see the film and he LOVED it, so of course that was all he talked about for weeks. 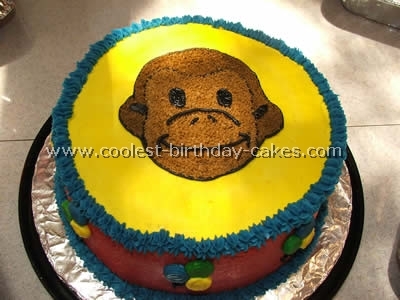 At first it didn’t occur to me to try to make a cake myself, so I went to every bakery I could think of to find a Curious George cake. As it turned out no one was making them, so knowing that I couldn’t let my little guy down, I decided to take a chance and make one myself. I grabbed one of his invitations and made an outline. Then a few days before the party I practiced using the star tip, because while I had made cakes in the past, it had basically been me making a box cake and throwing some frosting on it. 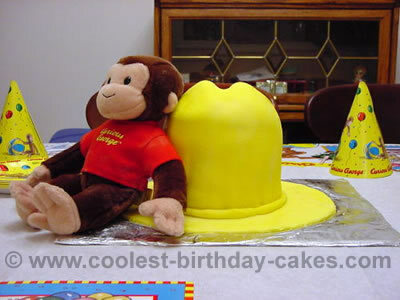 The Curious George cake was made up of two 9" round cakes. I frosted the center layer with chocolate and the outside with a cream cheese frosting. After applying two layers, I let the frosting dry and form a slight crust. Meanwhile, I transferred my Curious George pattern to some wax paper. Once I knew it wouldn’t stick to the frosting, I inverted the pattern and used a toothpick to trace an outline onto the cake. Next, I used black frosting and a writing tip to trace an outline. I tinted two shades of brown frosting for the face and hair. Using a small star tip I filled in the face area and ears. Next, I filled in the hair with the darker of the two brown frostings. After that, I gave him some eyes, a nose, a mouth, and definition in the ears. Last, I piped stars around the bottom and to edges and yellow stars around the sides to bring in some of the other colors from the party. I was really nervous because we had recently moved back to AZ to be near our family, and I was very self-conscious about my first try… but when my little guy saw it and started yelling "Yeah! 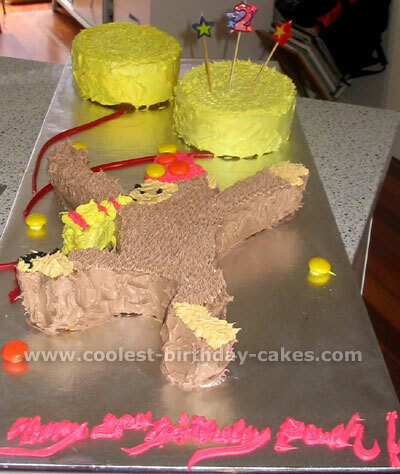 My Curious George Cake!” I knew it was worth the effort. It tasted great and my family was so supportive of my adventure that now I will be making all the birthday cakes from here on out! 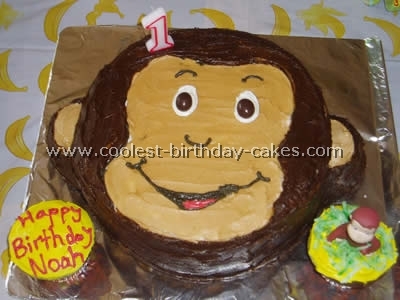 The theme for Béla’s 1st birthday was Curious George at the circus and I made two cakes as well as cupcakes. 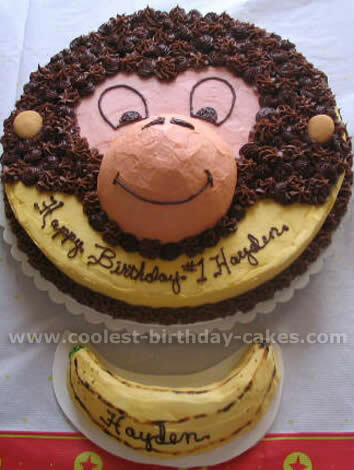 I made a three layer Curious George cake for the guests with two banana layers and a chocolate layer in the middle. I copied a picture of Curious George off of the website and used that as a stencil. I made a smaller circus tent cake just for Béla. That one was more complicated. I also made cupcakes with clowns and circus animal candies as decorations for the guests. My daughter was going to celebrate her 3rd birthday and fell in love with Curious George after seeing the movie. I made the cake out of the Wilton yellow cake recipe and baked a 11×18 sheet pan and one 6" round pan. I had to double the recipe to be sure I had enough. The decorating was done in the Wilton butter frosting for the base coat on the main and small cake. I then used chocolate butter cream for the body of Curous George using a star tip. The sky was done with Wilton piping gel, which I thinned with water and used Wilton blue paste in. The balloon was made with Wilton recipe for pour fondant icing. 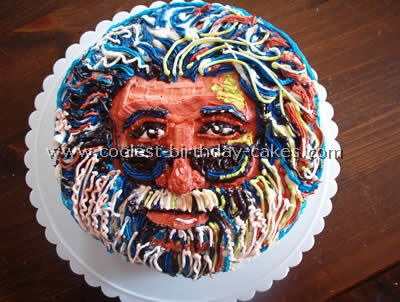 The cake was firm and tasted great! My son was fascinated with monkeys at the time of his first birthday, so my husband and I decided to go with a Curious George themed birthday party. The actual cake itself is just the funfetti mix from Pillsbury (cooked a little under temp guides so that it’s nice and moist). The icing is homemade almond buttercream, tinted a nice yellow or skin tone wherever needed. The hair is two different kinds of chocolate canned frosting (for color variation). We also used two different frosting tips for the curls so that there would be more texture to the hair. The nose of Curious George was used from a small ball pan and the actual face of Curious George was a huge round pan. My son’s "smash" cake we shaped into a little banana just his size. I owe the creative work to my wonderful grandmother–she’s fabulous! It was a great birthday party and the visiting trained monkey was an added bonus!! For this birthday cake idea, I used the Wilton doll cake pan and carved the sides and top to look like "The Big Yellow Hat." Roll out ready-made fondant icing that has been colored yellow. Cut a circle out of that using a large plate as a template. Place the carved "doll" cake in the center of the circle. Ice with buttercream icing first to create a smooth finish. After the buttercream icing add more rolled out fondant to the cake. To make moving the fondant easier, pick it up with a rolling pin. Trim the excess fondant with a knife. Make a small hat band with more fondant and place around the base of the cake. Wet the back to make the fondant stick to itself. The template for the Curious George shape was made by projecting a picture of Curious George onto a whiteboard and tracing the shape. I then transferred the shape to baking paper and marked the shape on a very large square cake. 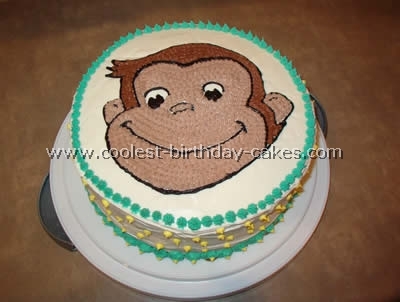 The large cake is a traditional butter cake, which used 9 eggs – it was a very firm cake which made cutting out the Curious George shape easier. The Curious George feet and hands had to be attached using toothpicks. The balloon cakes (same recipe but with 6 eggs each) were made using an oval shaped cake tin. The board was made by gluing two cake boards together and then covering with paper backed foil. I used Betty Crocker pre-made frosting that I coloured using Wilton paste. I piped the frosting on rather than spreading it or using a sheet of icing. I used giant Smarties (similar to M&Ms) to decorate the Curious George hat and raspberry licorice to make the strings for the balloon and the noise coming out of the Curious George noisemaker.